*The Revs. 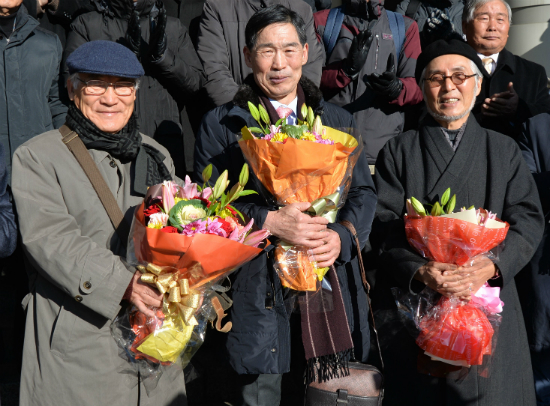 Na Do-hyeon, Jeon Byeong-saeng and Kim Myeong-su (from left), convicted years ago in the “Koreans in Japan & Overseas Students Spy Ring Incident,” smile as they hold congratulatory bouquets after being declared innocent at their retrial by the Seoul High Court this December 15. “Wholesale arrest of North Korean spy ring aimed at campus infiltration”: On November 22, about a month after Kim’s kidnapping, his family were aghast to see the front-page article of a major daily paper naming “spy Kim Myeong-su” as a member of an infiltration conspiracy team from the religious circle within a spy ring organization. Two of Kim’s fellow seminary students, Na Do-hyeon (now 69, pastor of Songseok Church in Seocheon) and Jeon Byeong-saeng (66, pastor of Danbi Church in Iksan), were also named as part of the spy ring. The rumored “Koreans in Japan & Overseas Students Spy Ring Incident” was thus made known to the public. 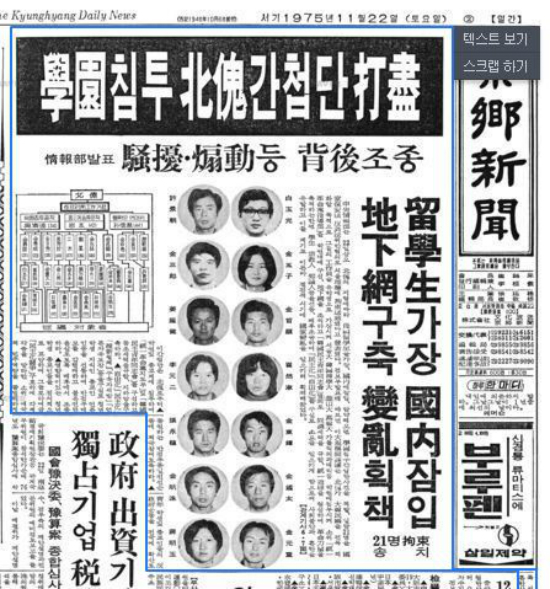 Korean residents of Japan who had returned to their homeland to study were turned into spies by the KCIA, while Korean students of Hanshin and other universities were made out to be their accomplices. The defendants in this case were all given heavy sentences by the court. According to the testimony of Rev. Kim and others, the person in command of this fabricated case, the head of the KCIA’s Anti-Communist Investigation Section at the time, was Kim Ki-choon, former Blue House chief secretary under President Park Geun-hye. The recent new documentary film “Spy Nation” deals in part with the fabrication of spy cases involving overseas students, and the role of former chief presidential secretary Kim. Talking by phone with Kukmin Daily on December 18, Rev. Kim said, “Although I was released from prison, I have been living in a prison without bars for the past nearly 40 years…I have been repressing my emotions all this time, but now at last I feel liberated.” He was first sentenced to life imprisonment, which was reduced to 10 years at the appeal trial, and ultimately spent four years and three months behind bars. Even after his release, he was kept under surveillance by the intelligence authorities for more than a decade. During his 20 some years of work as a professor at a Busan college, the intelligence authorities watched and reported on his every move. Since retirement, Rev. Kim has been at Yeham House, a care center for the elderly in Chungju, Chungbuk-do, where he looks after persons suffering from dementia. Nor has life been smooth for the other two pastors who together with Kim were wrongly imprisoned. In jail for four years and three months, and for two years, respectively, convicted of aiding and abetting spies and violating the Anti-Communist Law, once they came out they were accepted nowhere. Eventually giving up the fruitless search for employment, both pastors founded rural churches, which they have served for the past 30 some years. “Aren’t Christians always obliged to walk a thorny path?” asked Rev. Na. “It’s made me uncomfortable to be criticized and misunderstood, but I don’t trouble myself over it,” he said serenely. The request by the three for a retrial was granted about six years ago. Around that time there was a retrial of Koreans in Japan who had been judged guilty in the same fabricated spy case, and the three pastors were invited to take part in the process. Following the recent ruling, they are waiting to see whether the prosecution will appeal it; then they will decide whether or not to bring a civil suit against the state requesting reparation for damages.